With such a large percentage of time spent on moving rigs, including disassembling and re-assembling rig components, it is obviously incumbent on operators to minimize the costs and downtime involved in this complicated and time consuming mobilization process. The advent of horizontal directional drilling (HDD) technology has resulted in a plethora of opportunities for nimble rig movers, particularly in the United States, with the explosion of shale oil and gas drilling in recent years. With HDD, oil plays are going deeper and longer, requiring larger rigs and bigger equipment to move them. “Pad” drilling enables an operator to drill groups of wells more efficiently because it reduces the time it takes to move from one well location to the next. What that means for a drill rig mover, is the rig can now be picked up and transported a few yards using hydraulic walking or skidding systems, versus disassembling and reassembling the rig, a process known as “rigging up” and “rigging down”. Rig-moving companies use a variety of heavy equipment, including bed and picker trucks and tractors to move rig components, matting and buildings. Loaders are used to stack rig mats, some as large as 8 feet wide by 40 feet long, onto trucks in preparation for the next move. Cranes and specialized lift equipment such as spreader bars are often employed. Companies that move rigs need to be especially cognizant of road permits required for transporting highly specialized oilfield equipment, along with other obstacles to mobility such as narrow and unmarked lease roads and limited ingress and egress to/from the rig location. Weather and ground conditions are important factors that can make or break a move, with mud, ice and snow all requiring additional preparations due to their potential for causing costly delays. One company that has managed to carve a niche for itself in the market for oil rig transportation is Aveda Transportation and Energy Services. The Calgary based, publicly-traded company is the brainchild of oilfield services veteran Dave Werklund, who is known for the amazing success story of Tervita. From his roots in a small Alberta farming community, Werklund made an astute investment in the early 1980s in a small oil waste treatment company called Canadian Crude Separators. By the time Werklund took CCS private in 2007, it was worth over $3.5 billion. Its successor company, Tervita, now does $5 billion in business annually. Aveda went public in 2006 as Phoenix Oilfield Hauling, but ran into trouble after capital dried up during the 2008-09 financial crisis. When Aveda rebranded and recapitalized in 2011, Werklund stepped in as interim CEO, a position that became permanent when he was installed as executive chairman. Werklund brought in Kevin Roycraft as president and CEO to run the operational side of the business. Roycraft is an American with a couple of decades of experience in transportation logistics, specializing in the movement of bulk oil and chemicals. In an extensive interview, Werklund and Roycraft spoke to Oil & Gas Product News about the rig-moving business and how Aveda does things differently from their competitors. Aveda got its start in the Alberta oil sands, where extreme-cold weather and muddy, frozen ground forced Aveda to become efficient in their operations, said Roycraft. When the company took its expertise across the border to U.S. oil plays, they found their experience and larger rig-moving equipment paid dividends. Advantage indeed. Aveda is now one of the largest rig movers in the United States, with three quarters of its revenue generated from below the 49th parallel. The company has a presence in 80 percent of key American drilling regions, with a client list that includes some of the most important names in the business. Last summer the company acquired the rig-moving assets of Precision Drilling, which it proceeded to mobilize into Oklahoma. According to Roycraft, the acquisition “really put us on the... map. “It allowed us to double the size of our fleet in our two largest terminals as well as take the under-utilized assets and open a new location in Oklahoma to fulfill a customer request to open up in that location. We expanded our crane fleet quite a bit as well, so that’s been a huge acquisition for us,” he said. Of course, the recent oil price slide has caused the number of drill rigs deployed across the U.S. – the core of Aveda’s business – to decline, and that is causing concern for Werklund and Roycraft. But according to Roycraft, being new to the U.S. confers an important competitive advantage. Getting down to the brass tacks of an oil rig move, Roycraft said Aveda provides the cranes and the hauling equipment needed to dismantle the rig, load it onto bed trucks and transport it to the new location. “It sounds simple, but there’s certainly a complicated process and you need crews on the ground that absolutely know what they’re doing as far as safety and efficiency to make that happen, because each rig move is a project in itself,” he said. Of course, it’s in the mechanics of the rig move that the equipment really shines. Aveda’s vast fleet, placed throughout 15 locations in Canada and the U.S., includes bed trucks with a wheel base up to 410 inches, pickers up to 45 tons, tri-drive Texas beds, tri-drive tractors and planetary tractors. 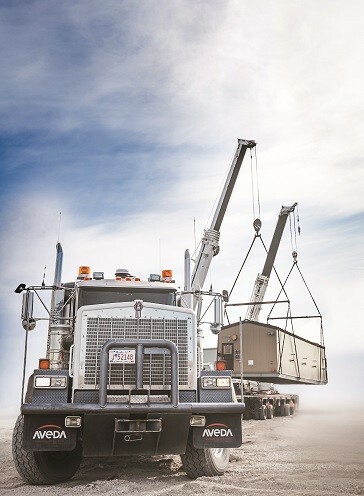 The fleet also features 110-, 135- and 165-ton cranes, 24-wheel trailers, 5-axle trailers, boosters and jeeps. Trucks in the fleet are mostly Kenworth and the majority of the cranes are from Kobelco. Roycraft said the larger-bed trucks and bigger drive trains and winches offer a big advantage to Aveda in the States, where there are several “mom and poptype” rig movers with smaller equipment. “We can handle larger and heavier loads. So it allows us to move a rig in fewer moves than much of our competition,” he said. “We are seeing about a 20 percent improvement in efficiencies over our competitors.” Roycraft added that the company has recently purchased 16 cranes, a significant part of the rig-moving operation, that it previously farmed out to third parties. Safety is a big part of their business and Roycraft emphasized it several times during the interview. A web-based training tracking system enables customers to check whether Aveda’s employees have completed proper training protocols. Roycraft says in the end, what customers want in a rig-moving company is a reputation for safety, alongside consistency and efficiency of service. Those three pillars are important, he says, especially as the company tries to market itself as a “national” rig-moving company to procurement departments at drilling contractors and oil companies.